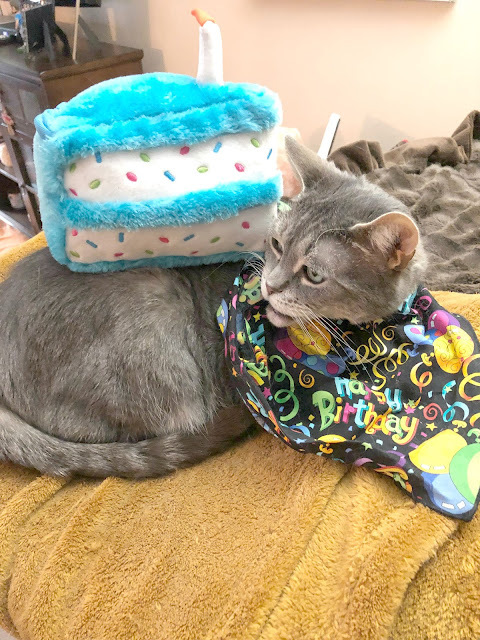 This is a sponsored post, written by me on behalf of Nestle Purina® I am being compensated for helping spread the word about the 2015 Better With Pets Summit. 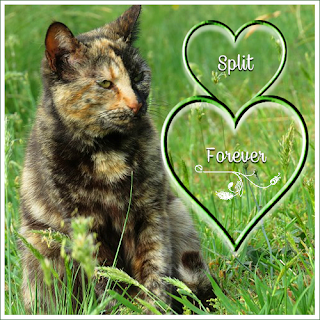 Cat Chat With Caren and Cody only shares information we feel is relevant to our readers. 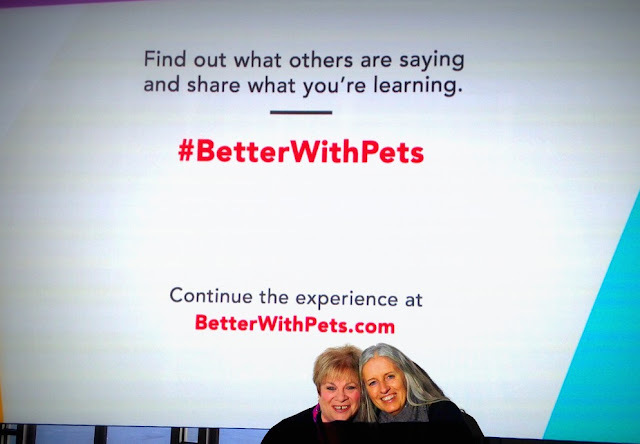 My challenge when writing this post about the Purina Better With Pets Summit 2015 is to try to convey to you just how incredible it was with about being overly verbose and without giving you photo overload! Warning! I don't think that is possible! I had the honor of being one of a number of digital influencers (Purina's term for us, which I LOVED! ), who were brought together with some of the brightest minds in pet science and culture to share how big, innovative ideas are improving the emotional wellness of pets and the people who love them. This was my second Summit, and I could never have imagined it would surpass my first, but it did! Everything Purina does is done with perfectionism and class, and they exhibit caring and concern for all of us that is unsurpassed. I have been a digital influencer for Purina since 2012, and each event I have had the privilege of attending has outshone the one that came before. 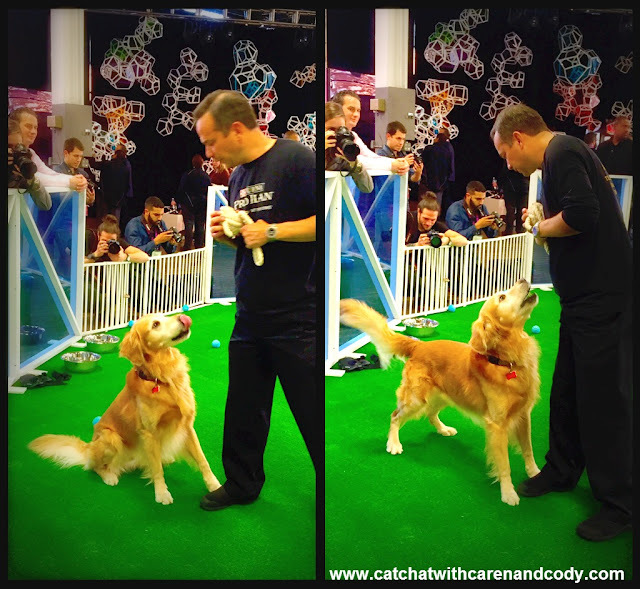 It was only fitting that I would be greeted by a dog or a cat on my way to an event featuring pets. It was incredibly kind of the police woman to allow me to take this photograph. 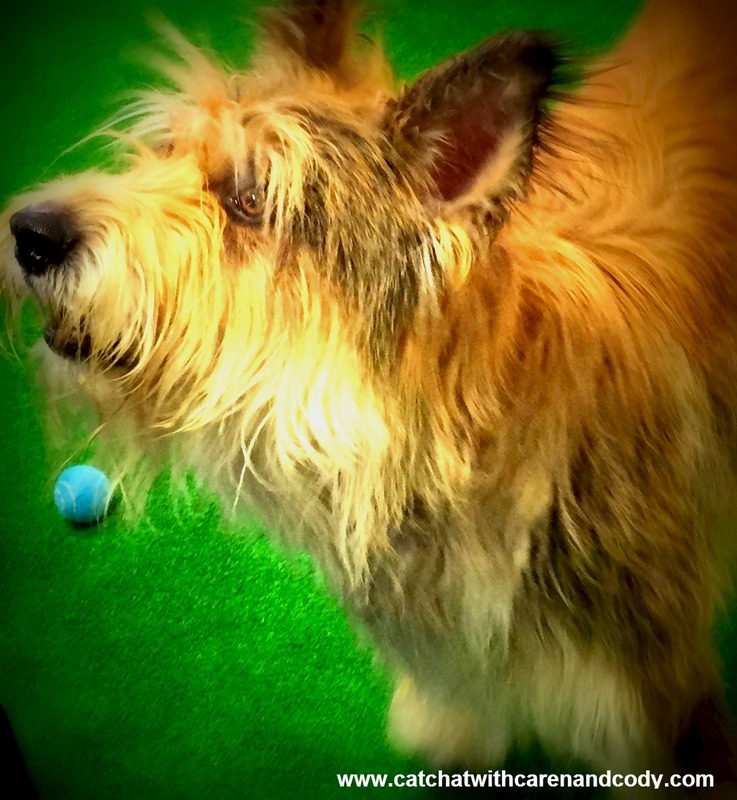 I arrived in one of my all-time favorite cities, New York, Monday, November 2nd and entered The W Hotel where the first person I saw was Dr.Jessica Vogelsang, author of All Dogs Go To Kevin, and the blog Pawcurious. After shrieking with glee because I hadn't seen her in forever, the lobby quickly became a "mini-reunion" for my fellow digital influencers, as many arrived the same time as me. Monday evening we were gifted with time to explore NYC and to reconnect with friends, and I took advantage of that by going to a scrumptious Greek dinner with Layla Morgan Wilde of Cat Wisdom 101. The restaurant was called Avra, and while the hostesses were less than friendly, the food was AMAZING! After dinner, since we had to be up super early to board the buses that would transport us to the Brooklyn Expo Center where the Summit was being held, after I got my Jimmy Fallon fix, it was "La-La-Land" for me!! Even in the early morning hours, in spite of not being thoroughly caffeinated, there was electricity and excitement in the air as a bus load of communicators from all different specialties chattered away filling the bus with a jovial hum of conversation! View from the bus window!! We waited in line to receive our badges and I had the pleasure of reconnecting with a number of Purina employees whom I hadn't seen in some time! We had time to mill about, grab a shot (or two or three) of espresso, and take some photos with our friends, (and I took one of the photographer who was photographing US! ), before the sessions began. and I with our heads cut off!! and it was fantastic to connect again! to take photos of HIM!! Then it was time for the summit to begin! The third annual summit shined a spotlight on the emotional wellness of pets and the people who love them. How do pets help us be well? How do we help them in return? There was a welcome by writer and comedian Josh Gondelman, who recently adopted an adorable senior Pug named Bizzy. Next up was the Keynote from Dr.Arleigh Reynolds, Purina Senior Research Scientist. This was my third time listening to him speak and it was a complete honor! Panel 1 was up next and that was "An Evolving Relationship with Cats?" which offered a close look at the dynamic, possibly evolving relationship between people and cats, and what it might suggest for a new generation of pet owners. It was moderated by Hal Herzog, Professor of Psychology at Western Carolina University. His research focuses on the psychology of human-animal interactions, including attitudes toward the use of animals and the impact of pets on human health. 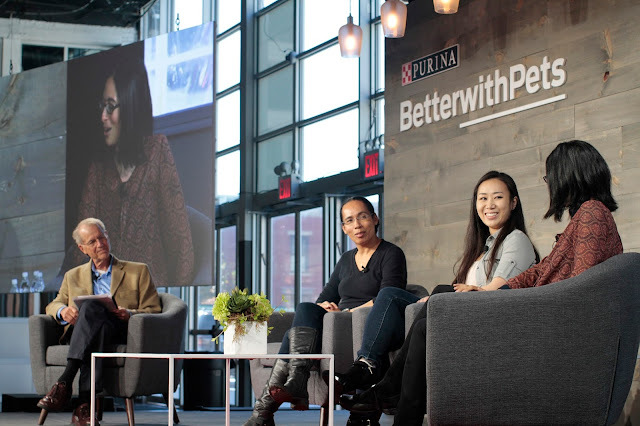 Other panelists included Sandra Lyn, a behaviorist at Purina, where she leads the Nestle' Purina Global R&D Feeding Behavior research program, Christina Ha, co-founder, Meow Parlour, NYC's first cat cafe'. 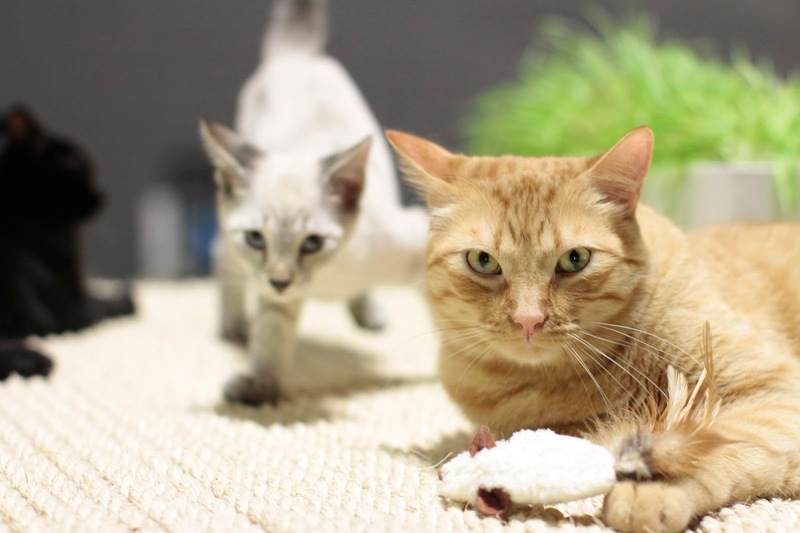 Meow Parlour's goal is to create a calm environment for connecting adoptable cats with cat-loving humans. Last but not least, Mikel Maria Delgado, Certified Cat Behavior Consultant and co-owner of Feline Minds, offering consulting, training and support related to cat behavior for cat owners, animal shelters, rescue groups and other organizations. 1 out of 3 Americans have cats, there are more cats than dogs in American homes. Soon millenials will be the largest percentage of cat owners, used to be the "Boomers" but the Millenials will be taking over! Common stereotype is cat people are more introverted, but social media is changing that due to cat cafes etc. Cat people are becoming much more social! Older people are more secure and less anxious about whether or not their pets love them, younger people tend to question whether they are loved by their pets much more. More work needs to be done to educate people about cats. Panel 2: Stress, Our Pets and Us was the next panel. This panel featured a discussion of the sources and effects of stress on pets, and how to manage stressors to enhance your pet's well-being. The panel was led by moderator Marty Becker, D.V.M, Chief Veterinary Correspondent, American Humane Society, and it featured Ragen McGowan, Senior Scientist, Nestle' Purina, her research incorporates a holistic approach including behavior and physiology to assess emotions in pets. She aims to understand what is positive for pets and quantify the human-animal bond from the pet's perspective. Also included was: Heather Lewis, Principal, Animal Arts an Architectural firm that has exclusively designed veterinary hospitals and animal care facilities since 1979. Last but not least was Tony Buffington, D.V.M., Professor Ohio State University. His clinical interests include stress effects on disease, obesity, evidence-based medicine and effective medical communications. Environmental enrichment is main cure for bladder infections in cats. 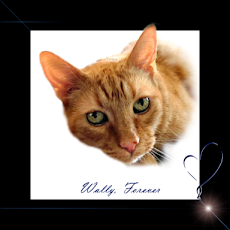 Stressors in cats can be anything from changes in temp, change in perfume etc! Did you know that dogs and cats prefer PASTEL colors? Cats who are kept in cages at the Vet and in Shelters should be HIGH UP.....(horizontal bar vision)...they experience less stress if they are high up. Good stress for cats and dogs can be found by playing and utilizing treat puzzles. The most important enrichment device at home for our pets is to have food puzzles, primarily for cats, but dogs benefit too! The third panel was Raising Pets and Kids, and since I didn't have kids, I really didn't focus on my note-taking during this panel. a play lab for agility dogs with wearable technology that monitored their activity as they played, and an area where attendees can see how nutrition impacts cognition and emotional wellness in pets. 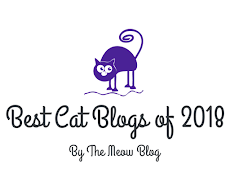 Due to the length of this post, please join us THIS WEDNESDAY where we will be featuring Part II of this series which will showcase the CATS that were at the Better With Pets Summit (and some humans too!!! ), as well as a little bit of this and a little bit of that. Then, please join us on Monday, November 16 when we will feature our Purina "Call to Action" post. Nestlé Purina PetCare Company is a global leader in the pet care industry. NestléPurina PetCare promotes responsible pet care, community involvement and the positive bond between people and their pets. A premiere global manufacturer of pet products, Nestlé Purina PetCare is part of Swiss-based Nestlé S.A., a global leader in nutrition, health and wellness. My human really enjoyed seeing you at the summit! But of course, there wasn't enough time - isn't it always like that? my Mom LOVED seeing your human at the Summit!! You are sooooooooo right, there is never enough time but Mom sure loves the times she DOES get to connect with your human! We've been hearing such great things about the summit! We especially love your take aways! I'll be pulling all of our food puzzles out of the closet! It's a great reminder of how important enrichment is. Both for the cats AND the humans! Sounds like you learned a lot of good stuff! The Summit sounds so amazing, and I hope that one day I get an opportunity to attend one myself. Reading all the posts about the Summit, I can just feel how exciting it all was! I'm so glad they had a good focus on kitties as well as puppies. Thank you for sharing some of your notes with us - I haven't seen a lot of that, and I was SO interested to hear all the talks they were having! it definitely was, you are most welcome and thank you!!! 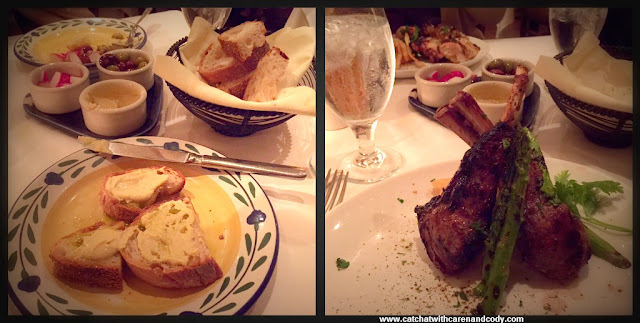 What a great write up and great photos, Caren! It was so wonderful to see you! It was so great seeing you at the summit - certainly one of my highlights! Wonderful write up and I look forward to reading Part 2! Purrs from Deb and the Zee/Zoey kitties. Thanks for the fantastic wrap up of the summit. It's really interesting to hear that they talked about dogs and cats working for our food. We're a big fan of food puzzles and think that whoever comes up with a way to make a food puzzle that isn't for kibble is going to make a bazillion dollars, because that's a big hole in the market right now. Thank you!!! Wednesday's post will be more "picture-heavy" than "copy-heavy" that is for sure! Oh do you mean for treats? Or for wet food? not sure what you mean....hmmm...maybe YOU should come up with the idea, I bet you could!!!! What a great review of the summit. I really enjoyed reading this. I wonder if my cats would do a food puzzle. I really liked the way you had a summery of the different topics. All very interesting. Well done Caren. Thanks so much Marg! There is a super good treat dispenser that I featured on the blog a couple of years ago, it is called Bat-a-Rat and it is made by an Engineer who lives in Michigan. (I used to use it for Cody all of the time and stopped, and now I have to begin using it again), it wobbles and it is made with SAFE plastic.....if you need the link, let me know........maybe I will try and surprise you with one if my tired mind remembers!!! Thank you! Sounds like a great conference. I did not know cats prefer pastels, I keep getting bright colors for my crocheted toys, I need to get some pastel yarn. it was fantastic!! Supposedly cats and dogs prefer pastels! It was news to me too! What a great event Caren and so many interesting topics. Can't wait for the second part. And I also love the term "digital influencers"! It was an amazing event Rosa and thank you! OMC that term is the BEST!! Rest assured, the 2nd part will be much more "photo-heavy" than "copy-heavy!" Such fun, fun, fun. Maybe Dad will get to see you there next year. I am hoping that I am even invited next year!!!! If so, you had BETTER be there! 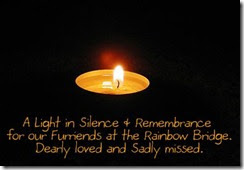 You were greatly missed! Oh how fun. I linked this post to Awww Mondays because there is so much awww. Sounds great, but I have to ask, what about dogs? Cats can't just take over the pet world! I think I need to find out more about dogs at this event. Sounds like a very interesting summit. Glad you had such a great time there. You really put a lot of detail in these posts! Always great to visit and love the airport photo with your friend. Have a great week. Thank you for sharing. thank you so much for noticing!! I came down with a bad head cold/ear infection right after the Summit and it took me a good four hours to work on this (going through photos and all), probably took me longer because I am so sick, and it is nice to have it be appreciated! Thank you!!!!! You have a great week too!!! What a fabulous conference! Thanks for sharing your experience with all of us. it was!! Thanks and you are welcome! What a great conference. Emma does not want to work for food. Her motto: Will Ignore You for Food! And, OMG, that dinner! I spent Monday night trying to regain the feeling in my legs from walking so much that day. :( Next time, I want to go eat at that place! So great to see and (cat) chat with you! I hope there's another time! That is what I love! I love that we are all honing in on something different!!! I am too old for the keynote speakers to be "hot" lol!!! It was so great to chat with you too and I hope for sure that there is another time! You are hilarious!!!!!!!! I think eating Cat Chow made you the amazing woman that you are today! We've seen several posts about this summit and they have ALL been super positive - it must have been an incredible experience being there..........lots of learn, lots of friends to reconnect with, and tons of fun. So glad you went! WOW!!!! This looks like it was a blast!!!!! 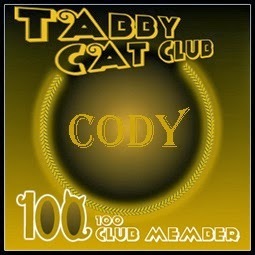 I am a cat person from waaaay back and definitely not an shy introvert! Cheers! That one picture where you took a picture of the man who was taking pictures toward you...I was shocked to see what looked like myself standing behind him! I was so surprised I came back and started at the picture. Almost a doppleganger of me say 15 years ago. That looks fancy! Maybe we can get in on it next year. It looks like there was tons to learn! - Crepes. Dat sounds like sooooo much fun. We sure wish we kuld get in on sum of these fings. Glad yous had a gweat time. Luvved seein' all da fotos. Yous font has gotten really small so weez kuldn't read everyfin', but it looks amazin'. Have a pawsum and restful week. Great wrap up of the summit! It sounds very interesting and informative! We're not digital influencers but maybe one day we will be! You definitely took better notes than I did! And I forgot that cats prefer pastels. Too bad they'll just have to get used to my earth tones!! SO great to finally meet you!!! Hope we see each other again sooN! Noooo!!! I only took a lot of notes on the first part, (before it became so hot there and I thought I would die and before I was distracted by CATS!! lol)!!!! I have all earth tones too! Go figure! It was a COMPLETE HONOR to FINALLY meet you!!! Now you know I really exist instead of just being someone who stalks your blog because I am in complete and total AWE of your talent! Hell, I am HONORED that you popped over here! Thank you!! I hope we see each other again soon too and get to chat more. You are exactly as I hoped you would be! Soooooooooo nice!!! it truly was!! OMG we were running like crazy and the trip was so short. I had already had plans with my niece for dinner Tues night, you could have joined us Monday night! Wed morning Dawn from Lola Rescued Cat met me for breakfast and that was just wonderful. Had to squeeze everyone in in such a short period of time. I sooo wish I had been able to see you though. This sounds like such a neat experience. I didn't even know it was a thing until I started seeing everyone posting about it! I will have to apply for next year! It was so fabulous getting to hang with you at such at awesome event! I can't believe how much I learned in such a short period of time. One word--->kittehs!!!! I feel the same!!!!! Oh, don't forget to email me...whenever you have time, no rush!!!!!!!! !